As social gaming continues to evolve on Facebook, companies are beginning to look beyond the very successful — yet tapped out — at-home female demographic. One new area that start-ups are flocking to exploits the exact opposite: men and their love for sports. Wedge Buster is announcing today that it has raised $2.2 million from investors who know a thing or two about sports, such as New Orleans Saints’ quarterback Drew Brees and pro skateboarder Rob Dyrdek. The Los Angeles-based company said other more traditional investors also participated in the round, including 37 Technology Ventures and other angels. 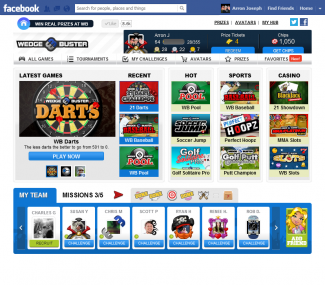 Wedge Buster’s Facebook game is actually a series of lightweight sports games, like Darts, Pool, Golf and casino games. In less than a year, the company has added 100 games to its platform, half of which it acquired, and another 30 percent it has licensed. The remaining games are developed internally, but most of the company’s development efforts are focused on the core platform and creating strong opportunities for sponsorships from companies, like CBS, and other brandname properties. Philp said the cash will be used to develop more games and deliver the company’s mobile game coming soon. Earlier this month, RocketPlay, a virtual Las Vegas sportsbooks, launched on Facebook, also calling attention to the untapped opportunity to serve sports fans. In its game, fans place virtual bets on their favorite teams. RocketPlay partnered with Zynga to promote its game. Very few other sports games make the top 100 applications on Facebook. Some exceptions are Geewa’s Pool Live Tour and Miniclip’s 8 Ball Pool. Likewise, Electronic Arts has been outspoken about how well FIFA Superstars has performed, even if its participation numbers have been relatively low. Philp said he’s confident they will be able to find the right kind of players on Facebook, despite all the games already available. It will also help that he has a few techniques for how to market effectively.